AFTER TWO DAYS APPLICATION FOR INTERRUPTION THE SENTENCE IN THE COURTS THESSALONIKI, WAS DECIDED THE RELEASE OF VALANTIS POUZIARITIS, on 17 june 2011, who has been imprisoned with no proof since the 6th of December 2009 and had been sentenced to 9 years and 3 months. 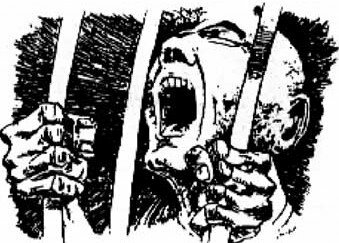 FREEDOM TO ALL POLITICAL PRISONERS! He was walking in the center of Thessaloniki at the night of December 6th 2009… He was arrested on a charge of gang organization and possession of molotov cocktails. On December 13th, 2010 in Edessa he had a trial with no evidence, 2 cops for witnesses and was sentenced to 9 years and 6 months imprisonment. Chrisovalantis Pouziaritis was the last detainee of the state since December 6th, 2009 the first anniversary for Alexandros Grigoropoulos murder. He had been accused for participation in clashes and he was charged with leading position in night’s riots outside Thessaloniki University, gang organization, possession and throwing of explosives and blast of them with a purpose of physical harm. The indictment was supported by 2 cops of MAT (riot police) without any proof beyond description and speculation that recognized him as “leader of the hooded” with the ridiculous argument that he was not wearing a hood because he was the leader!.. They had no evidence, nor the famous “made ones” like random loaded bags or anything else they could set up an indictment. Τwo more witnesses that testified explained why Chrisovalantis was present at the place and they confirmed his statement of not been associated with any political group and never participated in riots. The authorities verified that he had a clean file. Chrisovalantis is an ex-drug addict, currently taking part in a withdrawal program, the stopping of which can put him into danger of re-using drugs. He also has problems moving one of his legs, which makes it impossible for him to take part in conflicts.. It was a fixed and foregone trial. His unanimous conviction by all the judges and the jury, shows that they didn’t even need the whole procedure. Even in the final oration of the advocacy the president kept on making negative comments and ,with an obvious expression of boredom, told the advocate to be fast. The slavish jury unanimously convicted a young man to imprisonment, showing their obedience to the authority and to the president’s will. Chrisovalanti’s trial, ended with him being convicted to 16 years at first and then ,due to his previous good character it was reduced to 9 years and 6 months. This conviction is a proof of what we were all thinking. That it didn’t have anything to do with the trial, as it was a clear message sent by the state to all and most to those who resist. Ten years, it was also the penalty that Saraliotis, the cop who together with Korkoneas murdered Alex. Grigoropoulos on December 6 2008, was sentenced to as an accomplice to murder! The constant repression, the fighters’ arrests, the finks ‘s attacks to every free voice,the ideas being penalised, show in what a difficult position the authority is in. The 40 solidary people at Edessa’s courts, swore and ttacked the cops guarding the judges, and then went on a small demonstration through the town. WE WILL GET STRONGER, we will get more daring. They enrage the prudent ones and they make the more dialectical ones to prepare for conflict. This will be our answer.